What does an antibody titre mean? 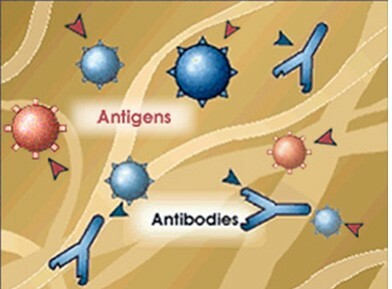 An antibody titre refers to the highest dilution of a serum sample that causes a positive test reaction (i.e. the most diluted sample that still causes a positive test reaction). Serum is the liquid portion of a blood sample from which the red blood cells, the white blood cells and the platelets have been removed. After separation, the serum will still contain antibodies. A positive test reaction differs for each particular test. As an example, one of the most commonly used antibody titres is for detection of antibodies against Leptospirosis (a bacterial disease). In this titre test, different strains of Leptospirosis organisms are exposed to serial dilutions of test serum. 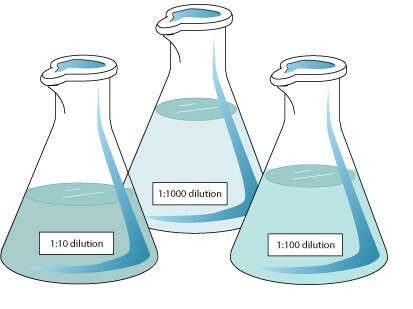 The end, or titre, is the highest dilution of serum that is still capable of producing a positive test reaction. For this particular test, a positive reaction is defined as the highest serum dilution capable of causing at least 50% of the Leptospira bacteria to clump. What do antibody titres indicate? "Since antibodies are only produced after exposure to 'foreign' material." Since antibodies are only produced after exposure to 'foreign' material including organisms such as bacteria and viruses, they indicate exposure to that organism. Because antibodies remain in circulation for quite some time, the presence of an antibody titre to a particular organism does not necessarily mean that that organism is the cause of the illness that your pet is experiencing. The lack of an antibody titre to an organism can indicate either of two things. The first is that no exposure to that organism has occurred and therefore your pet's current clinical condition is due to another cause. The other is that your pet has been so recently exposed to the organism that there has been insufficient time for antibodies to be produced in sufficient quantities to be detectable in the serum. Therefore if we suspect that a particular disease (for example leptospirosis) is causing illness in your pet, it is important to obtain both acute and convalescent serum titres. This simply means that blood samples for antibody titre testing are required at the onset of your pet's illness and again 2 to 3 weeks later. If your pet has been infected with the suspected organism, then a rising antibody titre (of at least four-fold magnitude) over this period will confirm the infection. If there is no increase in antibody titre, or if there is no significant antibody titre at either time period, then the suspected organism is not likely to be the cause of your pet's illness. What diseases do we commonly test for using antibody titres? Commonly tested for diseases include leptospirosis, and ehrlichiosis in dogs and toxoplasmosis in cats and occasionally in dogs. Why do we need antibody titres to diagnose these diseases? The clinical signs associated with these diseases are variable and can be confused with other diseases. Therefore, it is important to confirm the presence of a specific disease through laboratory testing. By doing so, we can optimize our therapeutic plan for your pet, offer you a better estimation of the clinical prognosis and also alert you to any possible zoonotic potential. Zoonotic means that the disease is potentially transmissible or contagious to people. Although most people infected with leptospirosisacquire the infection from contaminated water or through occupational exposure to wildlife or domestic animal hosts, leptospirosis can be transmitted to people by contact with contaminated urine or urine soaked materials from an affected pet dog. Therefore it is important that owners of dogs that may have the disease wear rubber gloves when cleaning up any areas that the dog may have soiled. Ehrlichiosis is not directly transmissible from dogs to humans but infection of both may occur through the bite of an infected brown dog tick. Therefore infected dogs serve as sentinels to indicate the presence of infected ticks in the area. Although Toxoplasmosis can be spread to people through infected oocysts (eggs) shed in the feces of cats, this is not a common route of infection in humans. The consumption of contaminated, poorly cooked meat or unpasteurized dairy products, especially those from sheep or goats, is a much more common method of infection. Like cats, most people do not develop clinical disease even if they become infected. However, if a woman is infected for the first time during pregnancy, the fetus is also placed at risk. Therefore, your family physician may recommend that you and/or your cat be tested for toxoplasmosis if you are a woman of childbearing age.